You may enjoy the flavor of chives on your baked potato, but perhaps you might not have explored this versatile herb much further beyond that. Chives are a wonderfully savory herb that definitely has its uses in the kitchen in a variety of dishes, in the yard for visual appeal, and even in the home as a pest repellent. (Find more pest repellent plants in this article: Natural Mosquito Control.) There are many ways to use chives in and around the house, and these ways include far more than just sprinkling them on baked potatoes. 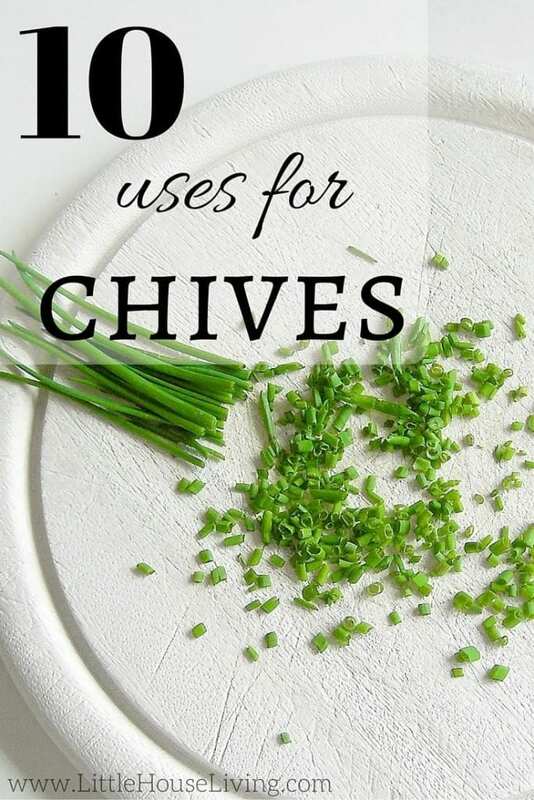 If you have ever been curious about the uses for chives around the home, take a look below at 10 uses for chives you can give a try today. You might find yourself surprised and impressed by the many uses for this wonderful plant. Chive plants can be found at your local gardening center or farmer’s markets for just a few dollars per plant. Or, you can choose to grow your own from seed. Grow it indoors in a window sill garden for all year use, or plant in your gardens and flower beds to harvest during the summer months. Either way, you are sure to find plenty of practical uses for it. Take a look! 1. Add some interest to gardens and flower beds. Just because chives are an herb, it doesn’t mean it can’t be decorative. Plant chives in your gardens and flower beds and enjoy the beautiful purple blooms they have. It is a great way to add a pop of color to your landscaping while still enjoying a plant that has other practical uses too! 2. Use as a natural pest repellent. Pesky aphids hate chives, so plant chives next to plants and vegetables that aphids tend to feed on. This is a great way to protect those plants without resorting to chemical filled products than can harm pets and kids. 3. Prevent erosion of your soil. This is a brilliant tip! Chives have very dense roots. Because of this, they help strengthen your soil and keep it in place. Who knew? Plant some chives wherever soil erosion seems to be a problem. Over time it will come back stronger and thicker really protecting your soil. Mildew can really harm your plants and ruin all of your hard work. Instead, create a concoction of chopped chive leaves and water. Boil the mixture for several minutes over the stove and when cool, place in a spray bottle. Spray plants to protect them from mildew. 5. Fancy up your fish. Chives pair well with fish dishes. Season your fish with a sprinkling of chives or marinate before cooking in a mixture of chives and olive oil. So tasty and healthy! 6. Boost up your breads. Add chives to butter or cream cheese and stir well. Spread on bagels, toast, crackers and other breads to give them a kick of natural onion flavor. These spreads are perfect for taking on picnics. 7. Add a pop of color to salads. 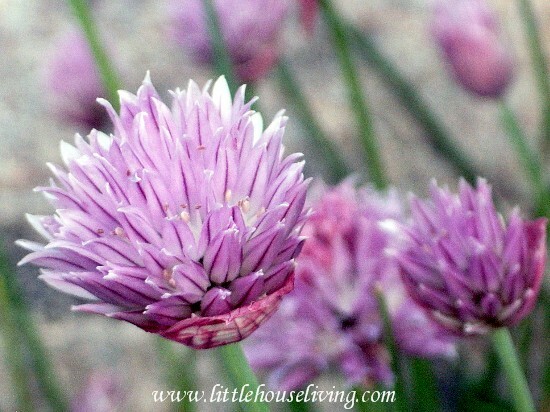 The purple bloom of the chive plant can be eaten, so pop them off the plant and add them to your salads. It gives a beautiful pop of purple plus adds a subtle onion flavor. Pretty and tasty! 8. Spice up salad dressings. Chive flowers added to plain white vinegar will not only add some flavor but will turn the liquid a soft lilac color as well. This makes it perfect for serving at wedding and baby showers, special brunches, or just when you want to feel a tad fancy. 9. Add to ice cubes. You can add chives to ice cubes to fancy up mixed drinks. Some people even like the flavor of chives in beverages such as Bloody Marys or Martinis. Get creative and try experimenting with chives in your beverages! Fancy up the flavor at brunch when you sprinkle chopped chives on your scrambled eggs or add them to your omelets. If you really want to whip up some egg-cellent eggs, why not try Chive Infused Deviled Eggs? This tasty treat is the perfect dish for a summer picnic or potluck! Take a look below at how easy you can whip some up. 5 Tablespoons of mayonnaise, light or regular. 1 Teaspoon of chipotle powder. More or less if you wish. 1. Set aside 2-3 chive stems and paprika powder. 2. Combine all ingredients in a bowl and mix well with a fork. 3. Separate the hard boiled yolks from the egg whites and add in the bowl. 4. Continue to mix well with a fork, adding mayo or mustard if more moisture is needed. 5. Spoon mixture into egg white halves. 6. Sprinkle the mixture with the reserved paprika and chive stems. Allow the eggs to refrigerate for one hour before serving. See how easy it is to add the taste of chives to many of your daily recipes and dishes? Give some of these tips and tricks a try and see how fun and frugal chives can be! What are some of your special uses for chives? Do you have a favorite dish you add them in? Good ideas! I had no idea that aphids hate chives. That’s awesome and I will definitely keep that in mind next year! My husband and I use chives all the time in cooking so it just makes sense that we should grow them! My favorite thing to do with chives is take the flowers and make a flavored vinegar! Fill a jar with clean blossoms. Cover the blossoms with vinegar. Let sit until a nice pink color! NEVER knew about the aphids! Thanks! Love this! Several uses I never would have thought of! Thank you for sharing at Celebrate It! Lots of great uses here. I’ll have to share this one with the hubs since he is in the garden all day. Very informative. This is by far the best use for a computer!